SAVE MONEY BY RUNNING THE HOUSE ON YOUR SCHEDULE Never come home to a dark house. Never leave the living room light on all day. Schedule the fan to turn on just before you arrive. Sync lights and devices to sunrise, sunset. The timers feature helps you save on the electric bills and extend product life. REMOTE CONTROL YOUR HOME ANYWHERE FROM YOUR SMART PHONE Switch your home electronics On/Off from anywhere with your tablet or smartphone using the free smart app. 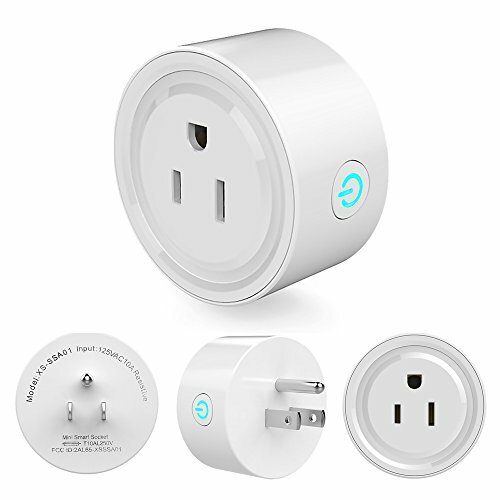 This wireless smart plug is a great assistant to the mobility impaired. VOICE CONTROL YOUR HOME WITH AMAZON ALEXA AND GOOGLE HOME Control your home with the power of your voice. Use simple voice command to turn On/Off your lights and appliances using Alexa or Google Home. PROTECT YOUR HOME Use worry-free timer/scheduler to turn devices On/Off at different times of the day to give the appearance that someone is home while you are away. 2. Open Amazon Alexa app. From Home menu, select Skills. Then search for ?Tuya Smart? inside the categories. 3. Select ?Tuya Smart? from the search result. Press ?Enable Skill? to learn the skill. 4. Now choose ?Discover Device? in Amazon Alexa app, and all your Tuya devices will appear in the list.